Use Quality Filters with Pour-O-Matic coffee brewers to produce delicious coffee. Special paper grade assures optimum extraction of coffee's taste. Superior stay-in-place design prevents coffee grounds overflow. 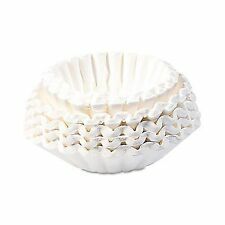 Type Decanter Filters 1000 COFFEE FILTERS. Color White. 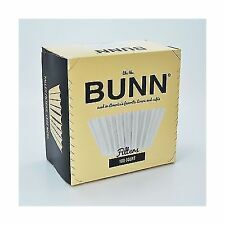 BUNN Regular Coffee Filter. Manufacturer BUNN. Use Quality Filters with Pour-O-Matic coffee brewers to produce delicious coffee. Special paper grade assures optimum extraction of coffee's taste. Superior stay-in-place design prevents coffee grounds overflow. 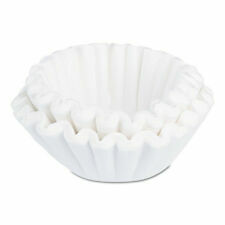 The BUNN Coffee and Tea Filters are specially designed to work with BUNN brewers. 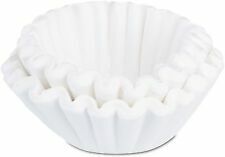 The selection of coffee filters is a vital step in brewing perfect coffee. BUNN manufactures the best filters from high quality, heavy weight paper and are uniquely designed for strength. Use with 12 cup coffee makers. 1/4" taller than other filters to allow for the quick flow of water into the brew funnel and the needed mixing action for complete, even extraction. Box of 250. Color: White. 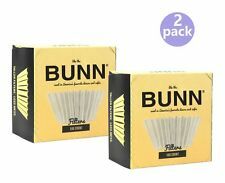 "BUNN Commercial Coffee Filters, 1.5 Gallon Brewer, 500/Pack BUNGOURMET504"
Fits 1.5-gallon coffee brewers. Stay-in-place design. Special paper assures optimum brew. Manufacturer BUNN. Product images are for illustrative purposes only and may differ from the actual product. Fits 1.5-gallon coffee brewers. Stay-in-place design. Special paper assures optimum brew. Country/Region of Manufacture United States. Product images are for illustrative purposes only and may differ from the actual product. Item shows no signs of wear, as shown in the attached pictures. CLAMP, HOSE-SNAP TYPE.59/.66ID MFR PART#: 12422.0001. Manufactured from high quality, heavy weight paper, so the water flows properly through coffee/tea. Uniquely designed for strength so the sides are taller and you don't end up with overflow and grounds in your coffee. Produced using an elemental chlorine-free (ECF) bleaching method. Material(s): Paper; For Use With: Bunn 3-Gallon Urns; Shape: Flat Bottom.Material: Paper. Dimensions:2-3/4" x 3" Color: White . 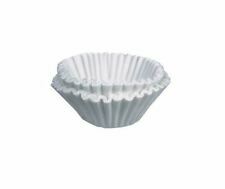 Bunn Quality Paper Coffee Filter, Urn 21X9 -- 250 Count. 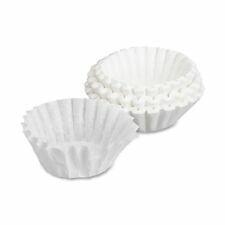 BUNN Commercial Coffee Filters, 6-Gallon Urn Style - 250 coffee filters. Manufactured from high quality, heavy weight paper, so the water flows properly through coffee/tea. Uniquely designed for strength so the sides are taller and you don't end up with overflow and grounds in your coffee.